5 tips for working out with your dog! Taking Fido for a walk is GREAT exercise but most people need a little more to get a complete body workout, obtain better balance and flexibility, and get their heart rate elevated for a more efficient cardiovascular system. Below are 5 tips that you can do with your dog to prevent boredom, burn more calories, and gain more strength. TIP 1: Make your dog’s walk a workout walk. Incorporate exercises along the way to help with your upper and lower body strength. A few ideas are pushups on park benches or tables, lunge walks, squats, step ups, and even tricep dips to prevent the “flabby arm syndrome”. TIP 2: Pick up the pace--don't let Rover pull you all over! Let Fido do his/ her business in the first 5 minutes of your warm up and then it is time for you to be in control. Do a power walk or add sprints and/ or hills to burn more calories and get the heart rate elevated. This makes your heart work more efficiently in the long run. TIP 3: Incorporate FIDO in your stretching and yoga. Your dog reads your energy, so at the end of the day try to do your stretches and be calm--your dog will follow suit. This is a good time to teach Fido the stay, sit, or down command. TIP 4: Be creative with your exercise. Take your dog rollerblading, kayaking, hiking, surfing, biking, etc. Get out of the rut of just doing daily walks. TIP 5: Always incorporate dog commands and games in your dog’s workout--the mental stimulation will tire them and you can have fun teaching them new things. It is NEVER too late to start teaching your dog new commands. Of course if you do not have the time to work up a plan, why not try a Leash Your Fitness class or event? They do all of the above and more to keep you and your furry friend fit! Please visit www.LEASHYOURFITNESS.com or call 619-822-3296 to find out more! Are you looking for new housing? Having neighbor problems? Do you want to get you and your dog into assisted service programs? A Canine Good Citizen Certificate can help pave the way. The AKC started a program in 1989 to emphasize and reward responsible dog owners and their pets with a special test and certification. This is called the Canine Good Citizen Test. The test first involves a pledge that you and your family need to agree to and sign. The Canine Good Citizen status tells the public, your new landlord and/or maybe even your insurance company that your dog is a member of your family and as such has worked to become the best possible citizen one with four legs can imagine. As your dogs legal guardian so to speak, you promise to attend to their needs such as Health and Safety which includes vet check-ups, vaccinations, proper diet and exercise. You agree to maintain control over your pet and abide by leash laws as well as equipping them with I.D. for safe return if lost. You'll also respect the rights of others and do what is necessary to assure that your dog is not running loose or barking causing disturbances. And don't forget the dirty job of picking up after them and lessening their footprint on your environment. Soon with your leadership which includes basic obedience, attention and playtime you will have the balanced dog all your friends and neighbors wish they had. You may be surprised at what you find on this list, which is just an example of the many items cats should stay away from. Baby food contains onion powder which can be toxic. Bones from fish, poultry, and other meat sources can cause obstruction or laceration of the digestive system. Grapes and raisins can damage the kidneys. Caffeine (soda, tea, chocolate) can be toxic and affect the heart and nervous system. Canned tuna in large amounts can cause malnutrition, since it lacks proper vitamins and minerals. 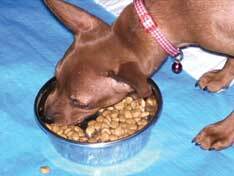 Dog food, if fed repeatedly, may result in malnutrition and diseases affecting the heart. Milk and other dairy products can cause diarrhea. Onion and garlic can cause anemia. Raw fish can result in thiamine deficiency leading to seizures. Tobacco affects their digestive and nervous systems and can result in a rapid heart beat, collapse, coma and death. Potato and tomato stems contain oxalates, which can affect the digestive, nervous, and urinary systems. Mushrooms can contain toxins, which affect multiple systems in the body cause shock and result in death. Cats are attracted to the smell of avocados, but they contain a fatty acid that will attack cats, which will cause them to have difficulty breathing. The word “allergy” is problematic because the symptoms you see aren’t always due to a true allergy. It’s estimated that only 10% of pets have true food allergies. Signs of a food allergy can include: itchy skin that doesn’t respond to steroids, recurrent ear and/or yeast infections, year-round symptoms, and digestive problems, including excessive bowel movements. As our pets are exposed to an increasing amount of toxins such as poor quality diets, pesticides, herbicides, urban pollution, and over-vaccination we are seeing an increase in all kinds of immune system problems, including allergies. While we may not be able to control all of these factors we can control our pet’s diet. Unfortunately the diet may be causing some of the problems too. Many other issues can cause similar symptoms: intestinal parasites, yeast, flea allergies, airborne allergies, contact allergies, chemical sensitivities, and more. Your pet may not have a true allergy, but a better diet is always going to improve their health, so the closer you get to fresh food the better. Too many people spends hundreds and thousands of dollars getting skin or blood tests done to test for allergies, but the results aren’t always conclusive and may even give false results so many vets no longer recommend them. Many vets suggest that the only true test for food allergies is to eliminate the suspected ingredients for one to three months and see if symptoms subside, then reintroduce ingredients one by one to “test” them. The best way to know exactly what is going into your pet is to feed fresh food. You may not need to do a strict elimination diet as some veterinarians suggest. Many animals improve on a fresh food diet that is not heavily restricted. You may still want to start with a simple formula of foods and see how they do for a month. You need to be sure you’re covering your pet’s basic nutritional needs, but it’s not as hard as you might think. Consulting with a holistic veterinarian or non-vet practitioner and reading a book about natural pet care and nutrition is important. The liver is the most important organ of the body for maintaining health. It is responsible for metabolizing food and detoxifying the body. A healthy liver is key to the body’s ability to absorb nutrition, maintain a healthy immune system, and deal with toxins entering the body. Herbs are your best ally in improving the function of the liver, and there are reputable products available at natural pet markets and from your holistic vet that will improve your pet’s liver function. Animals that exhibit symptoms like red skin will benefit from a diet that emphasizes “cooling foods.” Meats in this category include fish, duck, rabbit, and pork. Including omega-3 fatty acids is important because of their anti-inflammatory properties. Digestive enzymes and probiotics should be included in the diet of every pet suffering from allergy symptoms. By Margarat Nee, Lead Educator at Dexter’s Deli and owner of The Art of Dog. Exercise in the early mornings or at dusk and not during the hottest part of the day. collar to keep you and your dog safe when you are out at night. keep Fido light and cool. spray with an all-natural sunscreen. top that allows your dog to drink from a water bottle) with you. the sun; try our Flea the Scene insect spray and sunscreen. during the heat of the summer the car is not always the safest place for your dog. you should not bring the dog along with you on your outing. someone to steal your pet or your car. appropriately sized crate or be fasten in by a Harness Seat Belt. dog likes to stick his head out the window getting him a pair of Doggles is a great idea. ventilation can become a victim of carbon monoxide poisoning. be opened for cross ventilation is a good way to safely transport pets in a pickup truck. should leave your dog safely at home. When on a trip, it's tempting to skimp on the food and water to avoid extra pit stops. collapsible Travel Bowls and Travel Feedbags. do it during the spring and fall when the temperature isn't too hot or cold. paws off immediately with soap and water. you can use to keep the bait out of reach of pets. containers to keep them away from your pets as wells as little kids. mulch in their yards, it smells like chocolate to the dogs and they may try to eat it. your dog has a severe reaction, get him to a veterinarian immediately. Day. In fact, animal shelters across the country are accustomed to receiving "July 4th"
dogs—dogs that run off during fireworks celebrations and are brought to the shelter. planning ahead and taking some basic precautions. any thing that your pet could destroy or that could harm your pet if chewed. attending Fourth of July celebrations. local animal shelter so that they can be reunited with their owners. Being able to take your dog off leash to socialize and play with other dogs in a fenced, off-leash dog park is a real treat in communities where the standard rule is that a dog must stay in the yard or be on a leash. Because the first dog-park visit can be a little stressful for the novice user (human and dog), first-time visitors might consider visiting the park at non-peak times, mid-day Monday through Friday. It may take a couple of tries, or even a few weeks of visits, before your dog comes out of his/her shell. Make the first several visits short in duration. 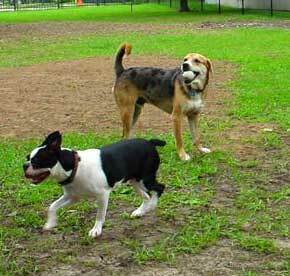 With regular dog park visits you may find your pet friendlier, well-adjusted and more playful. First and foremost, make sure your dog will come when called. This is an important command in case there is trouble. Practice before you go to a park. Ensure that your pet is currently vaccinated against common canine diseases. Contact your veterinarian if youre not sure which shots are important. Dog Parks are like elementary schools. Your canine child will be exposed to many different diseases while playing. You dont want to bring them home with you. Only bring adult and non-aggressive dogs to the park. Also, small children and dog parks usually dont mix well. Dog parks were created for socially adept dogs. Dog fights in dog parks are rarely a problem, because dogs consider it to be neutral territory. Walk your dog on leash from the car to the dog park entrance. The parking lot is not safe for loose dogs. Most dog parks have a double entry door system. Use this to your advantage, making sure that at least one of the doors is closed at all times. When the vestibule is empty, take your dog inside and close the first door. Remove the leash and then walk with your dog through the second doorway. Close the door behind you. Reverse this action on the way out. Once inside the park, all dogs should be off-leash, since leashed dogs may feel threatened and growl or bark when approached by off-leash dogs. If you wish to take a toy with you, make sure it is not your pets favorite. Dominance issues (DONT TOUCH MY TOY!) may arise which could cause your pet to become unusually aggressive and bite. Please clean up after your dog! Always, always scoop the poop right away! Its easy to forget, and all eyes will be on you! This is the single most important thing owners can do to insure the ongoing success of the Dog Park. Supervise your dog closely at all times. Some dogs are easily stimulated and overwhelmed by all the activity. Watch for signs such as: increased barking; intense or obsessive (not playful) chasing; hiding; growling; snapping; and finally, fighting. Now, go have fun! Treats; they come in many shapes, sizes & flavors, but have you considered how they can affect your pet’s overall health? And, how can they be used to not only show your pet how much you love them, but actually improve your pet’s health? First, let’s discuss: What IS a treat? Well, treats can be your typical biscuit or soft meaty morsels, but treats also include chews (ie: bully sticks), raw supplements like chicken necks, raw veggies, & even bones. Basically, anything that isn’t part of your pet’s daily diet. Llike us, we have to be informed about everything our pets eat…not only because we are adding calories to their diet, but also because there may be ingredients in the treat that could conflict with a health concern you & your pet are attempting to manage with diet. Or, the treat or supplement may not be easily digested by your pet’s sensitive tummy. First, let’s look at some specific examples of treats that may be harmful to your pet. Rawhides: These are very difficult to digest and may create gastrointestinal upsets even if your pet doesn’t normally have a sensitive stomach. Grains: Treats containing grains like wheat, corn or soy (although any grain can be a problem for some pets), should be avoided if your pet has a grain-allergy. Foreign Sourced/Irradiated: Beware of treats that are “too good to believe”. We all know dogs love the meat strip treats, and we’re all trying to watch our budget, but you really do get what you pay for. Inexpensive treats made in countries that do not use strict processing standards or that are irradiated can be detrimental to your pet’s health. Limited Ingredients: Treats that contain a few, pure ingredients and meet the same criteria you hold dear for your pet’s daily diet; whether you’re controlling the fat content, eliminating specific ingredients, or using unique proteins. All meat treats, raw supplements & meaty bones, tendons instead of rawhides and yes, even veggies are all acceptable and even beneficial treats for your pet.For example, chicken necks and raw meaty bones are not only an excellent source of calcium, but are also a great way to maintain good dental health. A good rule of thumb is to pick treats that have the fewest ingredients possible. If they have added glutens, soy protein isolates or other ingredients that you are unfamiliar with, just avoid them. And, be inquisitive, call the companies and ask them where they get their ingredients. A lot of US based companiessource their ingredients from other countries to save costs. They can put “Made in the USA” on the package, but they may still be using foreign-sourced ingredients. Use the same care and diligence in picking your pet’s treats as you do shopping for your own foods, and your pet will be happy & healthy. Canine obesity has become a very common problem with serious health implications. It is estimated that over 40% of dogs in the United States are obese. In a recent study by Pfizer Animal Health found that veterinarians considered 47% of their patients obese but only 17% of dog owners think the same. Why such a difference could be denial by the owners or simply the owners difficulty in recognizing when their dogs are overweight. You and your dog have a lot in common. You play together. You eat and relax together. And if you aren’t careful about how much you eat and relax, you both might pack on unwanted weight together – excess fat that can be tough to shed. Canine Obesity – Just How Bad Is It? Canine obesity is an important – and very common – medical condition with serious health implications. The American Veterinary Medical Association (AVMA) has estimated that there are 41.2 million pet dogs in the United States. Other sources estimate 40 percent of those dogs, approximately 17 million, are overweight or obese. A recent study conducted by Pfizer Animal Health found that veterinarians consider 47% of their patients overweight or obese but only 17% of dog owners think the same. Why the difference? It could be denial or the difficulty owners have in recognizing when their dogs are overweight. Hormonal Disorders: A wide array of hormonal disorders and other ailments also lead to or complicate canine obesity. They range from hypothyroidism to Cushing’s disease. Plenty. Next time he flashes those big brown “I’m soooo hungry” puppy dog eyes at you, consider that a fat dog faces an array of health problems. Any of which may add up to a shorter life. An independent study demonstrated that dogs that had their food intake restricted and were kept at an ideal weight throughout their lives had a median lifespan 15% greater than those dogs fed free choice. It's not too late to help your furry companion live a healthier and more active life. Take the BARC survey, print out your results and take the information to your veterinarian. Your veterinarian will determine the proper weight for your dog and work with you to devise an action plan that ensures the health and happiness of your best friend. If your veterinarian determines that your dog should lose weight, it’s important to take a slow and steady approach toward making a change, for the sake of safety and long-term results. Here are some canine weight-loss guidelines to consider and discuss with your veterinarian. Establishing a well-managed diet and exercise regimen is the number one priority in achieving and maintaining a healthy weight for your dog. Crash diets are not the answer. Losing weight at this rate is safer and more effective for establishing new healthy habits. Inducing weight loss at a rate faster than two percent of total body weight per week is more likely to reduce lean tissue (muscle) and result in a weight gain rebound. Any weight loss program that you and your veterinarian plan should be customized to fit your dog; based on starting weight, with regular adjustments as body mass is reduced. Prepare for the long haul. You are training your dog to eat less and exercise more. This is just as difficult for dogs as it is for humans. Make your end goal a healthy lifestyle for your dog and you will have a much better chance of success. Dogadillo would be pleased to assist you in selections of super premium foods that are very nutritious and will support your dogs weight lose. • Park users and dog owners assume all risk related to park use. • Enter at your own risk. By entering these parks, you agree to assume all duties and releases of liability as set forth in the Citys Waiver & Release of Liability. • Owners must remain with dogs and carry a leash within fenced areas. • Dogs must be licensed and vaccinated. • Dogs exhibiting dangerous behavior are prohibited. • Dogs must be wearing a collar with identification at all times. • Puppies under four months of age are prohibited. • Dogs in heat are prohibited. • Limit three dogs per person per visit. • An adult must closely supervise children. • Dogs must be leashed prior to entering and upon leaving the park. • Most County parks have a 6' leash regulation. • Retractable leashes are considered to be LONGER than 6' even if they are constrained to extend LESS than 6 feet. Government health regulations require pets to remain outside in patio facilities only. Your cafe host will be happy to direct you to the right location. 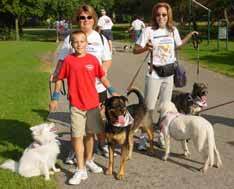 Bring pets that will either stay in a quiet manner on leash or in a small carrier by your table. Occupy your pet with a favorite chew toy while you dine. Dont forget to bring along a portable water bowl just in case the café cant provide one. Please remember when you take your pet in public, you represent all pet owners. Be sensitive to other diners and thank the Management. Be sure to tell the Management you found them through the PetLovers Publications Web Site or in one of our Pet Guides or Handbooks! What can happen if my dog bites someone? I have been asked that question numerous times over the years. I will try to cover the most important facts in this brief article. Hopefully you will never be placed in this situation. After all…you are in control and as long as you pay attention to your dog’s behavior this will only be something you hear about that happens to other people and their dogs! First, when a dog bites a person, three things happen simultaneously. A requirement to place the dog into a rabies quarantine to ensure that the dog could not transmit rabies to the bite victim; next, a determination is made on whether there is a justification for processing criminal charges (yes, it can be against the law for your dog to bite); and, finally, should the dog be declared a “Dangerous Dog” and either regulated or euthanized. I’m going to skip the rabies quarantine as that is a fairly simple process and is usually done while the dog remains at home. Don’t forget your civil liability too! That is when the victim might sue you in civil Court. You can lose your home over a dog bite. Under County ordinances, it is illegal for a person to “fail to prevent” their dog from “biting or attacking” a person “engaged in lawful activity” (SDCC 62.669.1). Therefore, depending on how the bite occurred, it could be a violation of law. As an example, if a person is walking down the street and your dog is at large and bites the person, which is not only a leash law violation, but also a public protection from Dog’s violation. On the other hand, if a bad guy breaks into your home and your dog bites him, there is no violation because the victim was not “engaged in lawful activity.” Be sure you don’t confuse someone entering your property to approach your front door with an “unlawful act”. Just because someone comes onto your property that doesn’t mean you can hit him over the head with a base ball bat and it doesn’t give your dog permission to bite that person! These are both misdemeanors which could get you 6 months in jail and a $500.00 fine. But it can get worse! If your dog has bitten previously or you should have known your dog had a propensity to bite and he bites again causing substantial injury, under State law you could be charged with a felony. County ordinance specifies that when a dog bites or attacks a person (engaged in lawful activity), twice in a four year period, that dog can be declared to be a “Dangerous Dog.” If, after investigation, it appears that the circumstances justify moving to declare a dog dangerous, the owner will be notified of the intent to do that and provided an opportunity for a hearing to determine whether the department can prove the allegation. If proven at hearing, the department normally imposes certain specific terms for the continued ownership of the dog. These terms typically include a requirement to maintain liability insurance; approved fencing; altering; special licensing; muzzling the dog when in public; and other similar requirements. However, in severe cases, especially when the owner has demonstrated an unwillingness or inability to safely keep the dog, the dog may be ordered to be euthanized. Luckily, this is rare. The bottom line? It is your responsibility to keep your dog safe and not put your dog in a position where he/she thinks he/she must protect you or your property. If your dog bites someone, it is probably your fault. You either failed to take precautions or you placed your dog in a no-win situation. So be your dog’s guardian, and protect your dog. That’s your job!